TC is one of the big companies which keeps up with the new technology trends. 2013 is the year when most brands introduced their first phablet devices and HTC doesn’t fall behind, it added a phablet member to its One family. The hybrid is called HTC One Max and will offer phablet fans a wonderful and big 5.9-inch Super LCD3 display which will deliver full HD resolution at the pixel density of 373ppi. The company has chosen the latest Android 4.3 for their latest creation in combination with their own Sense 5.5 interface. One Max will be the first device from the company’s portfolio to feature a fingerprint reader for maximum security of the information stored inside. This phablet will be powered by a quad-core 1.7GHz Snapdragon 600 CPU, backed up by 2GB of system memory. Users will be able to chose between a 32GB and a 64GB version of the model with an option to add more memory on an SD card. HTC One Max will be a great camera phablet too. 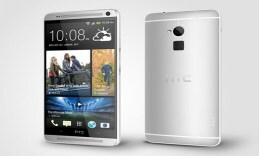 It will feature the same 4-Ultrapixel camera as the HTC One, along with a BSI sensor and a bright f/2.0 lens. HTC One Max will come with a high-capacity 3300mAh battery piece. Stay tuned for more information and a detailed video review about this and many more gadgets.